This Spanish Mint First is 500 Years in the Making! When an official international mint strikes its very first one kilogram silver coin ever, you know it's going to make history. It's even more historic when that coin goes back five centuries to detail the evolution of one of civilization's most influential denominations. That's why this spectacular 2017 History of the Dollar Proof from the Spanish Mint is making waves with both collectors and world history fans around the globe! SEVEN COINS IN ONE! 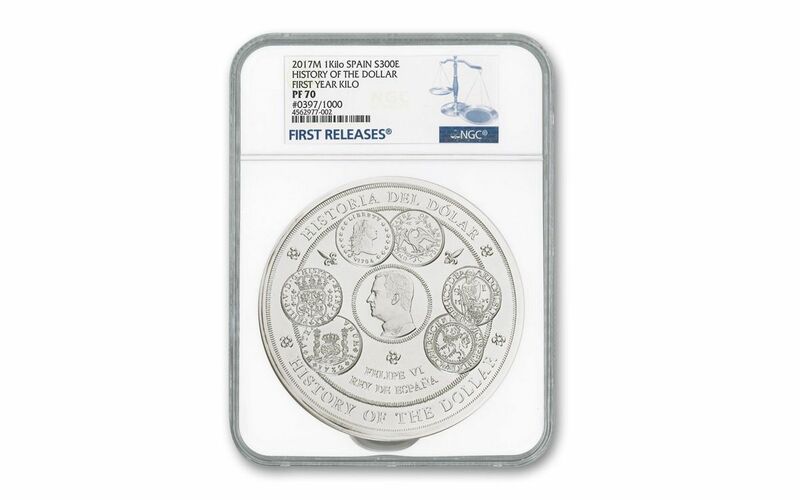 -- OK, not exactly, but this amazing 100 mm diameter proof features the obverse and reverse of seven dollar milestones. On the obverse, you'll find the 1794 United States Flowing Hair Dollar (the first issued by the U.S. government), the 1525 Joachimsthaler and the landmark 1732 "Columnario" Real de a Ocho, or Spanish dollar. Flip this massive coin over to discover the Dutch Lion Daalder (or Leeuwendaalder), the Norwegian Speciedaler, the Maria Theresa Thaler and the German Thaler. PROOF-MINTED IN PURE SILVER -- Each of these coins begins as a hefty planchet of highly pure 99.9% fine silver, weighing in at 1,007 grams. Then, using polished dies and multiple strikes, each proof comes to life with mirror-like fields and sharp details. 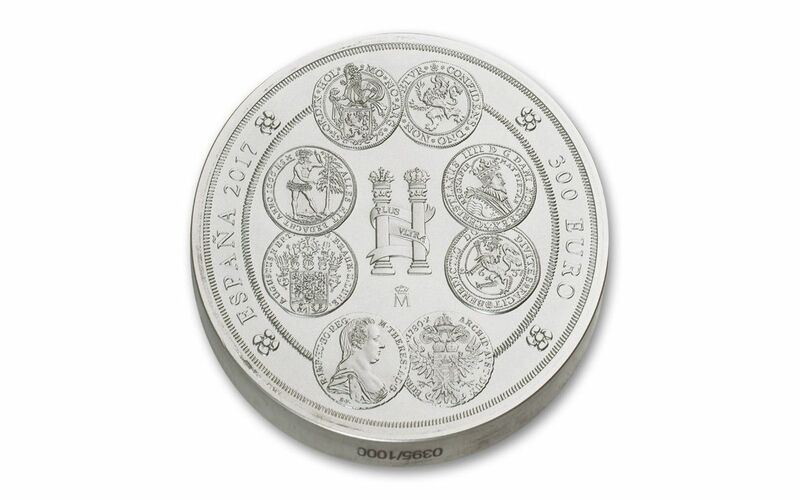 GENUINE SPANISH LEGAL TENDER -- Each proof is legal tender 300 Euros, reflected on the coin's reverse along with the famous Pillars of Hercules. In fact, look closely and you can see why these two columns intertwined with a scroll became the origin of the dollar's symbol! 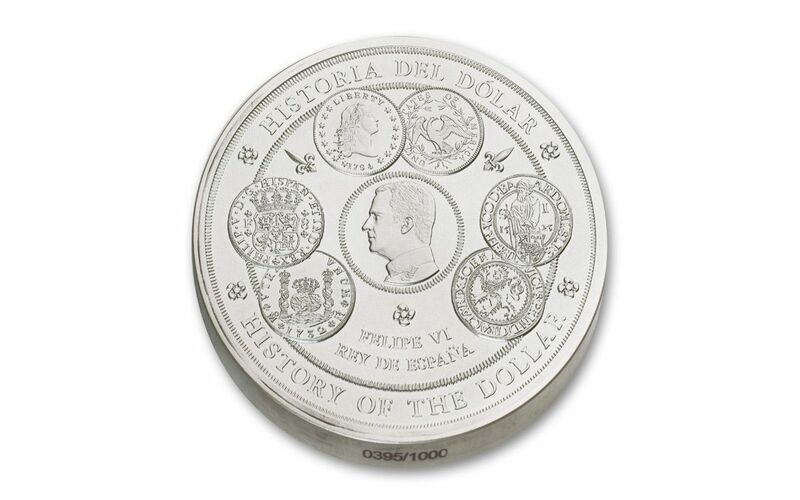 Turn this proof over to its obverse and you'll find the profile of Felipe VI, the current King of Spain. CERTIFIED FLAWLESS -- Your History of the Dollar Proof will also come certified Proof-70 Ultra Cameo (PF70UC) by Numismatic Guaranty Corporation (NGC), a distinction that means your perfectly-graded proof will have ZERO imperfections -- showing all features and fields exactly as the engraver and mint intended! In addition, your proof will be sonically sealed in an acrylic case -- giving you the best in protection while granting clear sightlines into every beautiful detail. Finally, everything is delivered along with an official mint certificate of authenticity and full-color story card. A VERY LIMITED MINTAGE! -- Only 1,000 of these proofs will be struck -- an incredibly low number considering this is a momentous first for the Spanish Mint! 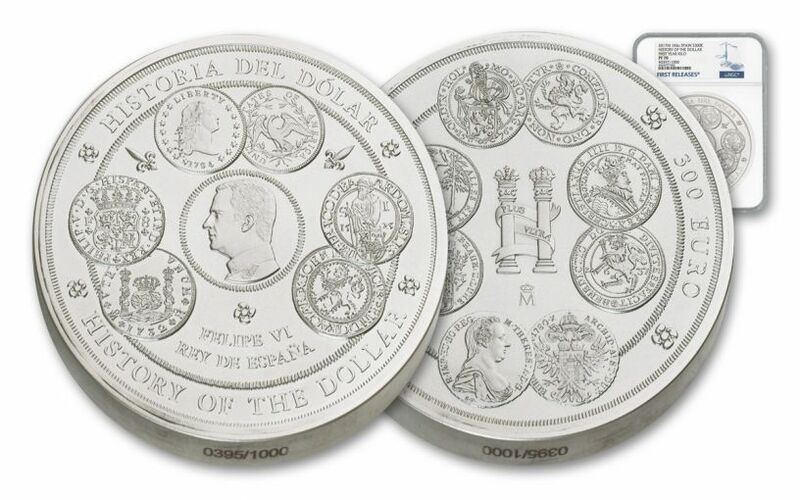 Whether you or someone you know is a silver aficionado, a numismatic nut or a global history buff, this proof is the perfect addition to any collection! But don't wait -- there's very few of these proofs to go around. Put a piece of mint history in your cart today!